J. J. Keller is the trusted industry leader for placards and more. Kresky Signs has partnered with J. J. Keller & Associates, Inc., the transportation leader, to assist with your placarding needs. J. J. Keller offers an unmatched selection of flip placards and is committed to providing Kresky customers with the same quality and design they have experienced from Kresky for many years. Direct replacements for Kresky flip book placards are available for purchase now and will be shipping in May. View our comparison chart below. 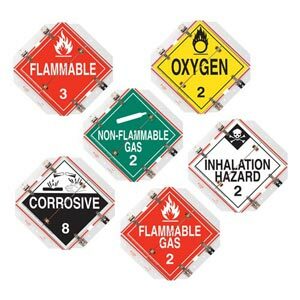 Standard 16"x15.5" Flip-File Placard, 8-Legend Worded Set, White Back Plate Kresky book flip placards meet requirements of 49 CFR Part 172.519. 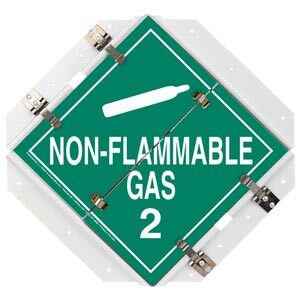 Standard 16"x15.5" Flip-File Placard, 8-Legend Worded 2-pc. 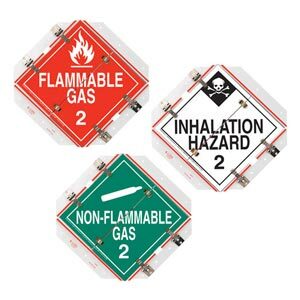 Set, White Back Plate Kresky book flip placards meet requirements of 49 CFR Part 172.519. Super 16"x15.5" Flip-File Placard, 8-Legend Worded Set, White Back Plate Kresky book flip placards meet requirements of 49 CFR Part 172.519. Super 16"x15.5" Flip-File Placard, 8-Legend Worded 2-pc. Set, White Back Plate Kresky book flip placards meet requirements of 49 CFR Part 172.519. Standard 16"x15.5" Flip-File Placard, 10-Legend Worded Set, White Back Plate Kresky book flip placards meet requirements of 49 CFR Part 172.519. 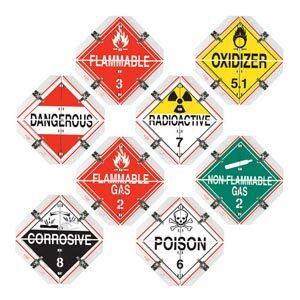 Standard 16"x15.5" Flip-File Placard, 10-Legend Worded 2-pc. Set, White Back Plate Kresky book flip placards meet requirements of 49 CFR Part 172.519. Super 16"x15.5" Flip-File Placard, 9-Legend Worded Set, White Back Plate Kresky book flip placards meet requirements of 49 CFR Part 172.519. Super 16"x15.5" Flip-File Placard, 6-Legend Worded Set, White Back Plate Kresky book flip placards meet requirements of 49 CFR Part 172.519. Super 16"x15.5" Flip-File Placard, 2-Legend Worded Set, White Back Plate Kresky book flip placards meet requirements of 49 CFR Part 172.519. 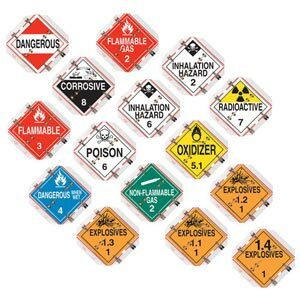 Super 16"x15.5" Flip-File Placard, 3-Legend Worded Set, White Back Plate Kresky book flip placards meet requirements of 49 CFR Part 172.519. 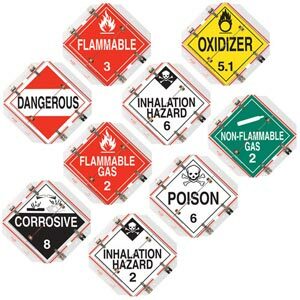 Standard 16"x15.5" Flip-File Placard, 1-Legend Worded Set, White Back Plate Kresky book flip placards meet requirements of 49 CFR Part 172.519. 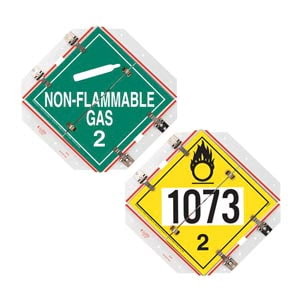 Super 16"x15.5" Flip-File Placard, 9-Legend Canadian Wordless Set, White Back Plate Kresky book flip placards meet DOT & Transport Canada placarding specifications. 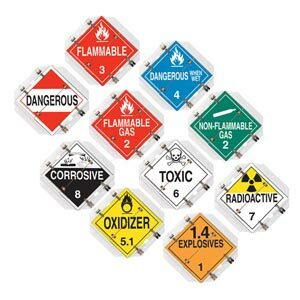 Super 16"x15.5" Flip-File Placard, 15-Legend Worded Set, White Back Plate Kresky book flip placards meet requirements of 49 CFR Part 172.519. 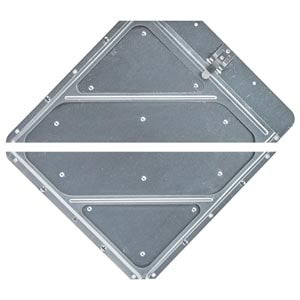 Heavy-Duty Riveted Aluminum Placard Holder Top and bottom corners are clipped so an entire placard unit can fit on one panel of roll-up door. Available in unpainted or white. 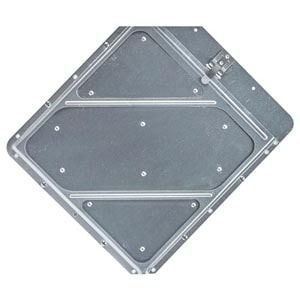 Heavy-Duty Riveted Split Aluminum Placard Holder Top and bottom corners are clipped so an entire placard unit can fit on one panel of roll-up door. Available in unpainted or white.